I have a great love of tomatoes. When people ask what is my favorite fruit, I say tomatoes and they look at me weird. If I could only have one fruit for the rest of my life, I’m sorry peaches and blueberries, I love you but I could live on tomatoes. So, when I saw this recipe on Smitten Kitchen this summer, a recipe that promised a perfect taste of summertime, it moved to the top of my to do list. And boy was that a smart move. 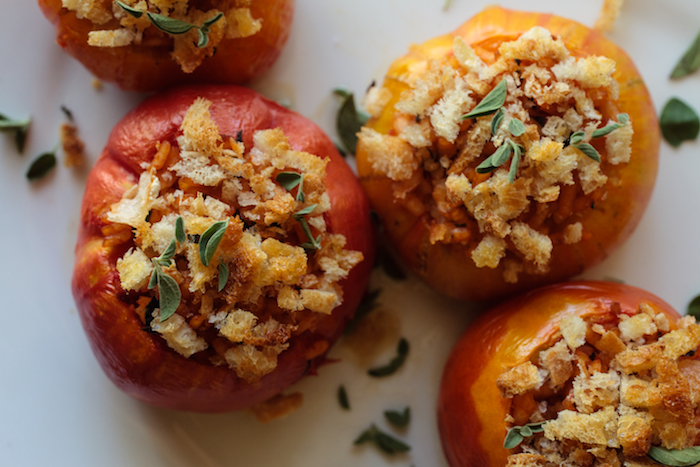 There was something magical about the taste of these roasted tomatoes. They did taste like pure summertime. They are beautiful and rich, but with the sweetness of a perfectly ripe tomato. And the best part? 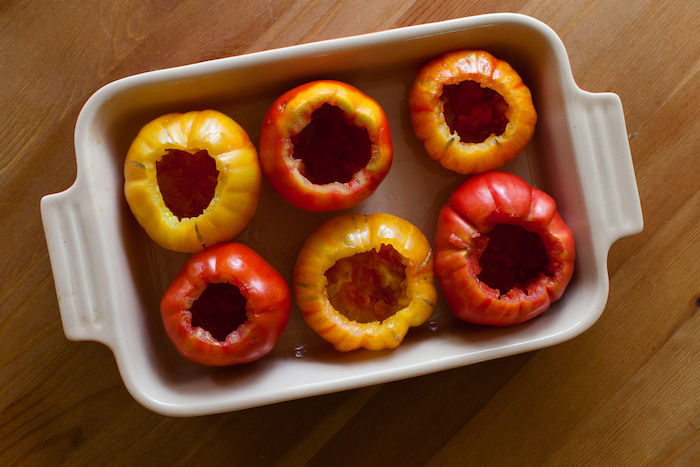 Roasting tomatoes goes a long way to restore that wonderful fresh summer taste, even if you are using off season tomatoes. That means you can enjoy that ripe tomato taste even in the winter. Now, for this version that I made, I picked the prettiest heirloom tomatoes that I could find. I couldn’t resist the beautiful oranges and different shades of red. Summer tomatoes are just my favorite thing in the world. 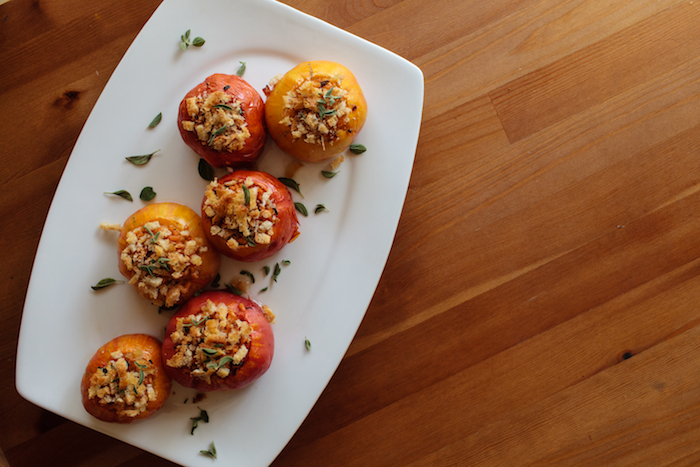 Try out this great recipe from Smitten Kitchen. And if you haven’t been to her site, check it out. There are always fun recipes to enjoy. Prepare tomatoes: Cut the tops off the tomatoes and scoop out tomato juices, seeds and flesh into a non-reactive (i.e. just about anything but aluminum) bowl. Be careful not to pierce the bottom of the tomatoes. Prepare reserve: Puree scooped-out tomato flesh in a blender. Heat a large skillet over medium heat, then add 2 tablespoons olive oil, heating it too. Once hot, add onion, garlic and red pepper flakes. Cook until the onion begins to soften. Add rice and cook them together for about 3 minutes, or until rice toasts a little. Add tomato puree and bring to a simmer, then reduce heat to medium-low. Season with 3/4 teaspoon salt, then cover skillet with a lid, and let simmer for 10 to 15 minutes, stirring occasionally, until rice is par-cooked. Adjust seasoning if needed. 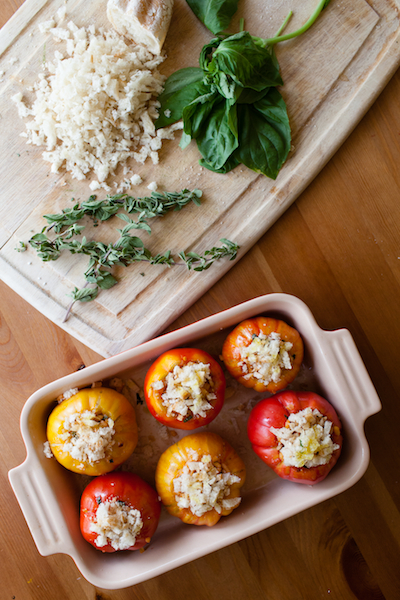 Reassemble tomatoes: Stir fresh herbs into tomato-rice mixture. 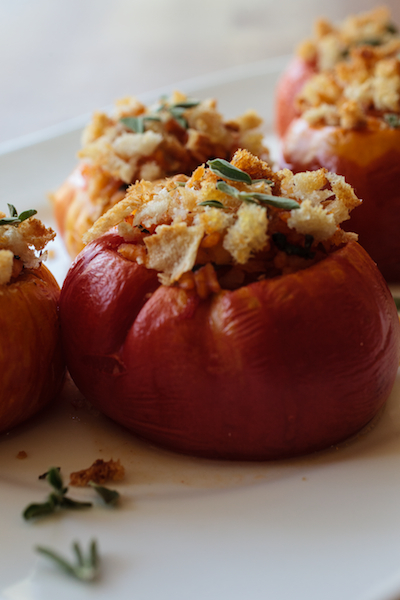 Arrange tomatoes in baking pan then spoon mixture into tomatoes, filling them just 7/8 of the way to leave room for the rice to finish expanding. Top with breadcrumbs and drizzle lightly with olive oil. Bake: Uncovered for 30 minutes, until tomato walls are soft and the rice inside has finished cooking. Serve hot. Helpful info. Fortunate me I found your website by accident, and I’m stunned why this coincidence didn’t came about earlier! I bookmarked it. excellent publish, very informative. I’m wondering why the other specialists of this sector do not realize this. You should continue your writing. I’m confident, you have a great readers’ base already! I’m still learning from you, but I’m trying to achieve my goals. I absolutely enjoy reading all that is written on your site.Keep the stories coming. I enjoyed it! Just desire to say your article is as amazing. The clearness in your post is just spectacular and i can assume you’re an expert on this subject. Fine with your permission let me to grab your RSS feed to keep updated with forthcoming post. Thanks a million and please keep up the rewarding work. I simply want to mention I am very new to blogging and site-building and honestly enjoyed your website. Very likely I’m planning to bookmark your site . You surely have fantastic articles and reviews. Thanks a bunch for sharing with us your blog. on giving the greatest degree of attention to, since 1989. A male scholar was trying to get in touch along with his girlfriend and she did not have a cellphone for him to textual content message her.